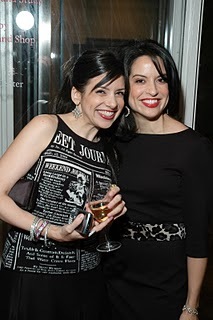 Because of my pre-jewelry life as a journalist, I’ve always been a sucker for newspaper-print clothes. Posing with my sister while wearing my Wall Street Journal top in 2007. Click for original post. 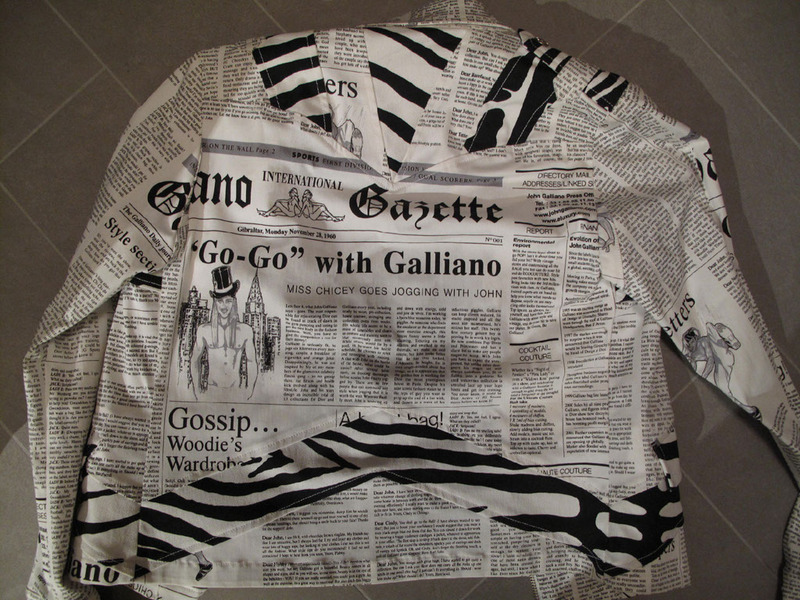 I got this newspaper-print jacket a couple of years ago on eBay. I won’t be wearing it again. Check out the back. 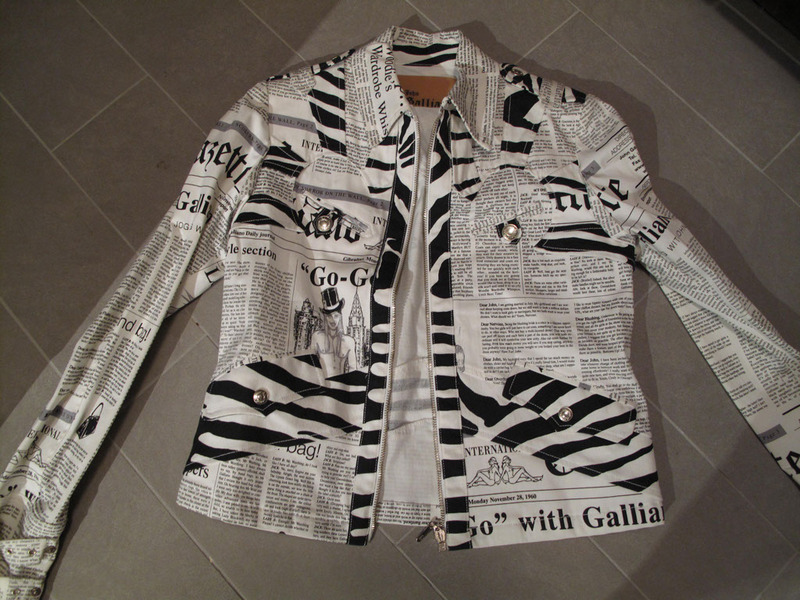 Yep, that’s Hitler-loving John Galliano‘s name in eye-catching black and white. If I owned any Christian Dior or John Galliano clothes that didn’t have his name in bold on them, I wouldn’t hold their origins against them. But this clearly labeled piece is way too weird to keep. Maybe Galliano will start hanging out with movie director Lars Von Trier, who was declared persona non grata by the organizers of the Cannes film festival after he awkwardly joked about Hitler and Nazis. It might not be the beginning of a beautiful friendship, however, because Galliano blamed his Hitler talk on drunkenness while Von Trier blamed his comments on his sobriety. I love that excuse. It’s a refreshing change from blaming shizz on substance abuse. In fact, from here on out, I’m going to attribute all my bad behavior to being sober. Take that, society! The Cannes jury didn’t hold Von Trier’s behavior against Kirsten and awarded her the best actress prize. As a bonus, she’s won my heart: I’d definitely pick Kirsten if someone asked me that “who are your girl and boy crushes?” question right now. For the boy part of the query, I’d answer “Stop Making Sense“-era David Byrne. Why? I don’t know. Maybe big suits turn me on. It is a cool jacket but I am with you. I would not be comfortable wearing it. That’s a damn shame. Maybe you could auction it off and donate the money to a good cause. 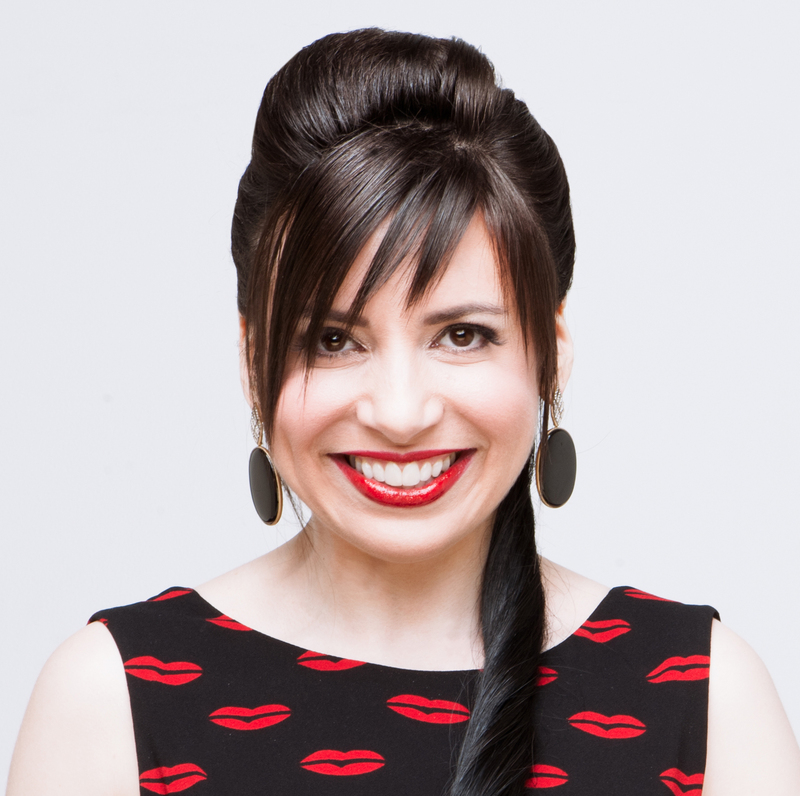 Did you hear that comedian Lisa Lampanelli (whose shows were protested by the Westboro Baptist Church) agreed to donate $1000 for every protester that showed up at one of her shows to an AIDS organization? 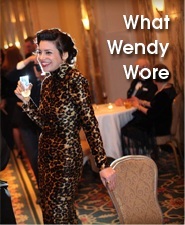 She wrote a check for $44,000 in the name of the WBC. Hopefully they’ll have a taker! I understand how you feel. And if I were in the presence of a Hitler-loving, anti-semite, racist or sexist I would feel a deep, simmering historic anger. I do know that addicts, wonderful gentle loving people here-to-fore, do very bad things: steal cars, hit people, yell and scream, perform lewd acts, behave so insanely that the police are forced to taser them into submission. I knew John as a gentle man with brilliance that brought me to tears in the days before Anna Wintour rescued him. I believe strongly that there’s a loneliness for some homosexual men that fail to have life partners and compounded with a world of excess is another darker place. I believe that John had to destroy his career in order to get out from burdens that an addict cannot manage. I do not believe that the monstrous words he said, unthinkable words, were his but that of a man losing his sanity because of those addictions. I have had people in my life with addictions and they were sometimes able to hide the darkness until it exploded. Baseball bats to car windows, stripping and running around, cutting, suicide attempts, throwing limes at fragile treasures. In some the urge to destroy overwhelms. I believe that John is not a monster, that he does not have a hateful or unkind bone in his pampered damaged body. I understand but I am truly saddened. He is alive and what matters is that he finds solace and help. He will have to live with what he did to end that which he could not manage and for me it’s only painfully sad. Horrified … hateful, unbearable. My family is Jewish although I was sent off to Catholic school. I don’t like hate a bit. Sad, really sad. Horrific. Cannot forget that there is evil. Maybe Mel Gibson should start a club, now that I think of it. He can invite like-minded asshats. I think that creative people should stop blaming the drugs or alcohol for their racist and stupid behavior. Addiction is a terrible illness, I’ve seen some of my friends destroyed their lives but hate is also an illness; an illness of the soul and of the persons IQ. In another note, you and you sister have such beautiful and contagious smiles! Hard to get through it, I cringe too much. Maybe you can just put a big patch over him? Is this really what happens to you when you become a big star? They all have foot in mouth syndrome. I totally agree with you. His behaviour was unforgivable. A big patch will help! That video made me cringe. As the daughter of an alcoholic, I found it hard sometimes not to take comments personally; was it the disease talking or did my father really feel this way about me? All I can say now is that he was in terrible pain, mentally and emotionally. I wonder if John Galliano is the same though I cannot excuse his words. As for Lars, some people are just evil. Or stupid, or both. A shame about the jacket, but you could do a little paint job on the back of it, grafitti syle, to cover the unfortunate Galliano-piece. I have to comment about von Trier though, as he obviously doesn’t hold anti-semittic views and support national socialism. What he meant to do was make a provocative joke, but without good command of the English language combined with some social awkwardness this backfired. Being a Norwegian, I have to say this simple, ironic type of jokes and awkwardness is quite typical of many Scandinavians. Unfortunately, it says Galliano in quite a few places (that place is just the biggest) and I’m not up for that kind of DIY, but hopefully someone will buy it at the thrift store and do that very thing! I also thought Von Trier was trying to make a joke but it just went wrong from the start. I was like “STOP!!!!!! before it’s too late.” But then it was too late. I love Norway! I was there in 2007, and my husband was just at a meeting in Oslo. I was almost yelling “Stop!! !” at Von Trier while watching the Von Trier gaffe on tv. I just hope that he hasn’t broken all ties to the US film industry, as I do think he is a great director and deserves an American audience. I wish he could grow up and just be a little less provocative for the sake of being provocative though. Oh, and instead of tatooing his fingers, he should have had your swear rings…. Oy–hadn’t seen the actual footage. Kristen Dunst must have been feeling miserable up there! The look on Ms Dunst face was just classic. She knew his speech was going nowhere good. Asshat isn’t a strong enough word for someone who would blame those remarks on sobriety. 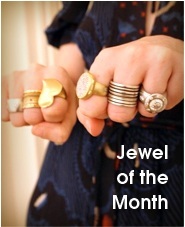 Hi my dear-sounds a fabulous idea to donate your pieces to the Housing Works Organisation!! Perhaps you should give the jacket to Lars von Trier? It is such a cute jacket. But I am with you. That jacket is so adorable. Maybe you should just tippex out his name? The look on Kirsten’s face says it all. Ahh, Talking Heads. Good stuff. WHAT THE HECK… I’ve never seen that video of Von Trier… so freaking weird. Jesus. If a desire to people-please is all you need to justify behavior, I could get away with murder. v.T.’s comments were so vomitous that I had to stop listening after 23 seconds. I’m too wimpy right now. Maybe I’ll be able to stomach them in their entirety later. I did look out for Kirsten Dunst’s facial expressions, and they were notable indeed. I can see why you’re not keeping that jacket. I spotted the “Galliano” name on the front before I scrolled down to see the back, and I knew what you were about to say.